Long before I became a dietitian, in my youthful days when I ate everything and anything without feeling guilty, I'd indulge in McDonald’s at least once a week. It was worse when I had to deal with a wave of homework, my parents left to go out for dimsum and I’d head to the golden arches (which was conveniently just below our apartment building). I always ordered the same thing: McChicken with fries. I loved the fried chicken. Skin that crisped and crackled in my mouth, like a mini fireworks party, it was the best part of my weekends as I stressed over mind-numbing calculus equations and English essays. Nowadays, I stay away from McDonald’s (except when it comes to an Oreos McFlurry) though I still eat the occasional fries (with spicy mayo!) when I dine out and try to make a conscious choice to eat less deep-fried foods. But once in a while I have a hankering for fried chicken. Maybe because I forbid myself to eat it so all I can think about is eating crackly chicken skin, ripping meat off the bone, slathering some sauce, chew, chew, chew, swallow, and repeat. I wanted tender, juicy bits of chicken. I wanted to get my hands dirty. McDonald’s and KFC was out of the question, nor was I going to sacrifice vats of oil for deep frying. 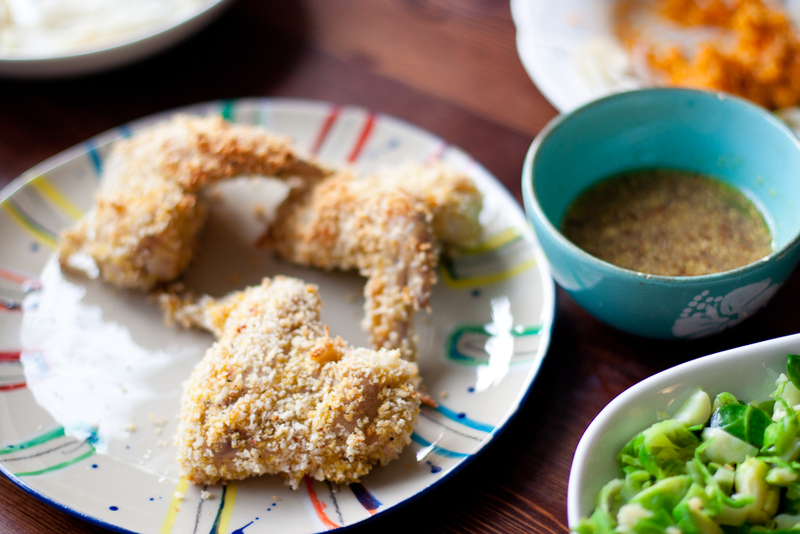 The solution, my friends, is panko. 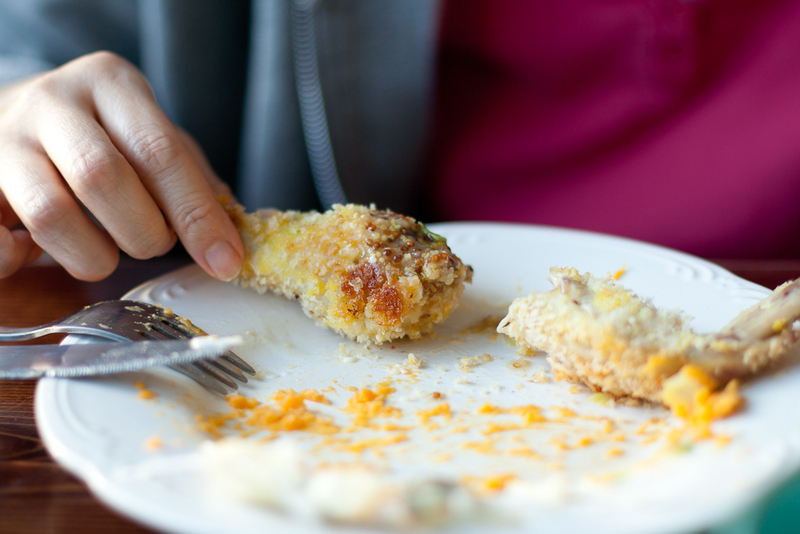 Typically used in Japanese tempura, panko crumbs are light breadcrumbs. 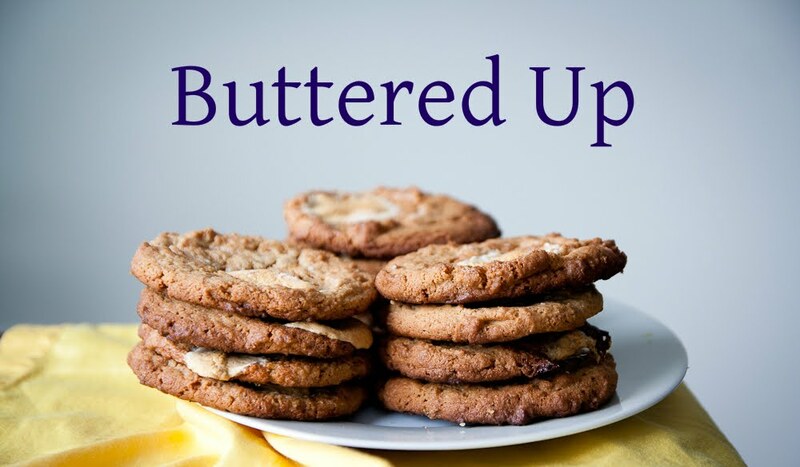 They don’t burn in the oven and retain their crispness. Here, I used them in chicken wings. 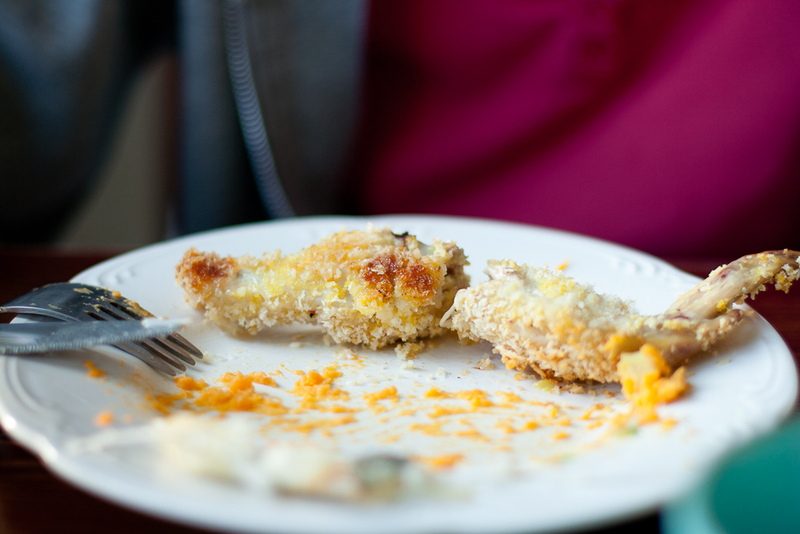 I dredged them in an egg wash, coated them in panko breadcrumbs and before baking them for about 45 minutes. Meanwhile, I mixed together a mustard dipping sauce using whole grain mustard and lemon juice. It was easy peasy. The hardest part was whether to dig into my wings first or take these pictures during dinner, thankfully, I managed to do both. 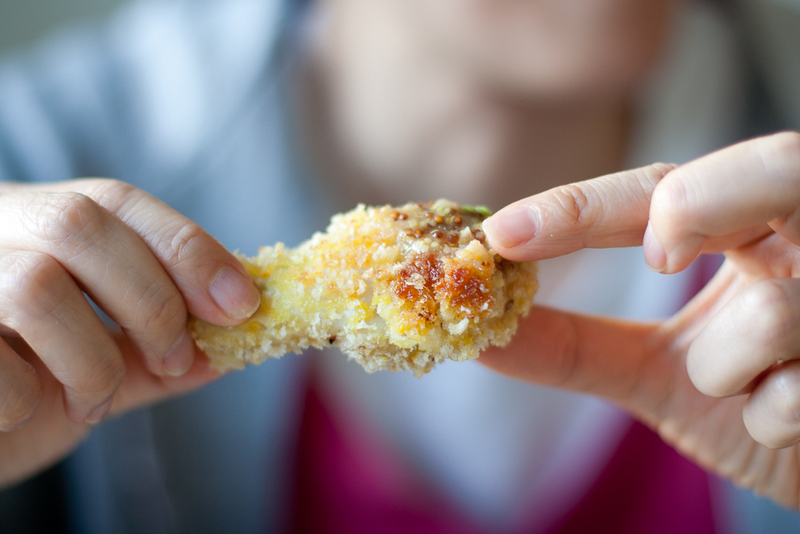 The crust is undeniably flaky, one bite into these wings and you hear multiple crackles as your teeth give way to moist strips of chicken. My mom and I ate these for dinner with mashed sweet potatoes and a brussels sprouts slaw (I always have a nice dish of veggies on the side). Now you too can relish in the carnal pleasure of eating meat without the deep-fryer. Go on, eat it double-fisted, I won't judge. Preheat oven to 400⁰F, set rack in the centre of the oven. In a large mixing bowl, whisk panko crumbs with ¼ teaspoon salt and parsley. Whisk egg and 2 teaspoons Dijon mustard in a large bowl. Place chicken in egg mixture, turning to coat evenly. Season chicken with salt and pepper. 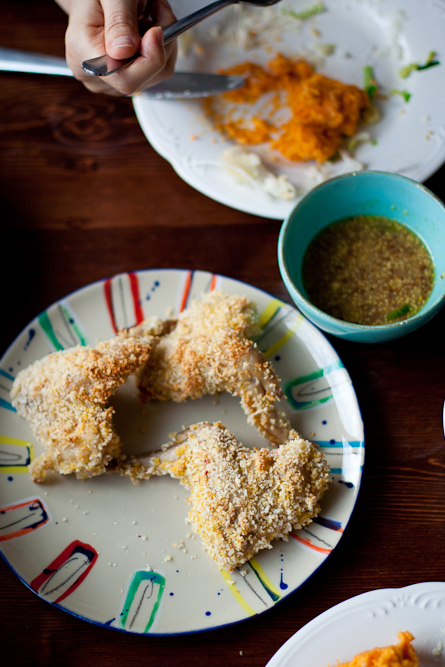 Add each piece of chicken into panko, turning to coat evenly on all sides, pressing chicken into crumbs to help them adhere. Transfer, skin side up, to a shallow baking pan. Bake chicken until well browned and cooked through, about 30-40 minutes. Let stand, uncovered, 5 to 10 minutes to crisp. To make the sauce, whisk together the water, mustard and lemon juice. Serve with chicken and eat your heart out.